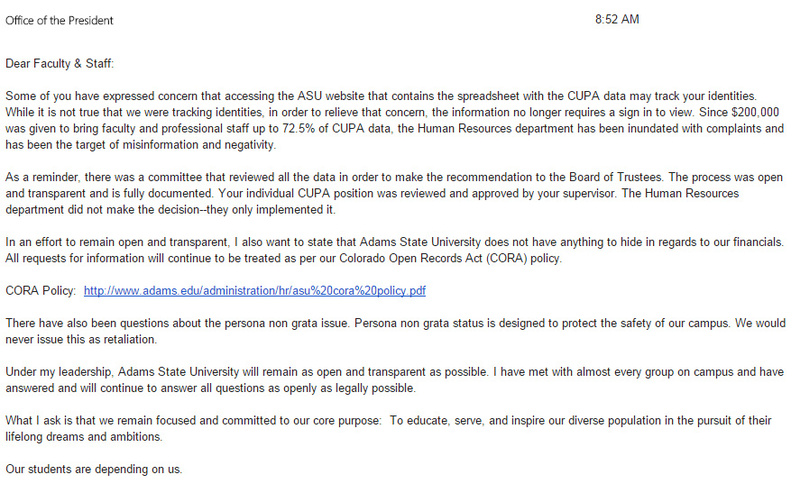 In an October 20th email to the campus, Adams State University (ASU) President Beverlee McClure maintained, “Under my leadership, Adams State University will remain as open and transparent as possible.” This is a respectable goal and one that every public institution should have as part of its core operating principles. 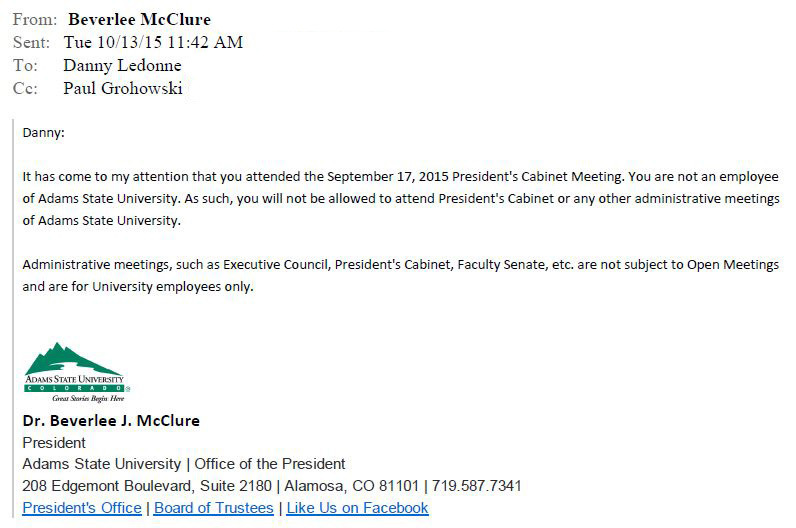 However, the administration’s official conduct has been much more opaque than President McClure’s claim would imply. Without any working definition of which meetings are “administrative,” it is difficult to understand how Faculty Senate, without any members of administration in the governing body, would qualify. Yet Faculty Senate is much more responsive at keeping current meeting minutes posted for public review. Meanwhile, administrative governing committees have been over nine months late on posting meeting minutes – and still counting. Executive Council has not posted meeting minutes since January 19, 2015 and President’s Cabinet has not posted meeting minutes since February 12, 2015. Why not? Who is responsible for posting these minutes and why haven’t they been held accountable for an ongoing dereliction of duties? If members of the public are not permitted to attend “administrative meetings” (as they are “non-employees”), and if the minutes for these meetings are not published, how can the public know what decisions are being made, and how those decisions are being made, at a public institution funded by the taxpayers of Colorado? President McClure claims that her leadership will ensure ASU is “as open and transparent as possible,” yet ASU administration has been failing to post its meeting minutes, which are fundamental to public transparency.